A vending machine with the DISC, or "Delays to Influence Snack Choice," installed. On the display window, a written decal tells customers they'll have to wait for an extra 25 seconds for unhealthy snacks. If you wanted a bag of Doritos from one of Brad Appelhans' experimental vending machines, you'd have to wait. 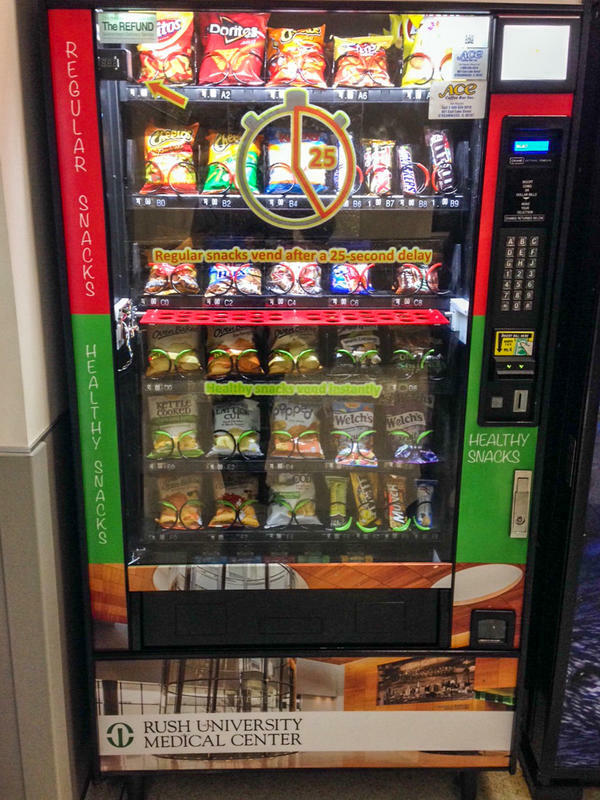 The associate professor of preventative medicine at Rush University Medical Center designed a device that fits inside of vending machines and waits 25 seconds before releasing the typical processed snacks. But healthier fare — like peanuts or popcorn — drops instantly. Think of it as a sort of "time tax." The idea is that every second you spend waiting for a snack will make you want it less, similar to how a tax on sugary drinks might get you to buy less soda, Appelhans says. "We were interested in the ability to test whether time delays can nudge people to healthier choices," he says. So, he created DISC, or "Delays to Influence Snack Choice," to test the idea. The device is a platform inserted inside a vending machine that catches snacks falling from the top half of the machine, where a vending machine operator would sort all of the unhealthy snacks. On the display window, a written decal tells customers they'll have to wait for an extra 25 seconds for less-healthy snacks. For several months, Appelhans put DISC into vending machines around Rush University, which has a patent pending on the device. Each month, he tried a different price condition — like lowering the price of healthier snacks or raising the price of less-healthy snacks. Then he watched what happened when DISC was added to the machine under each price condition. During the months DISC was in operation, people started going for more healthy snacks, Appelhans reports in a study being presented this week in San Diego at the annual meeting of the Society of Behavioral Medicine. Whenever the delay was implemented, "we saw a roughly 5 percent change in the proportion of healthy snacks" sales, he says. That's roughly the same increase in sales as what he saw when he lowered the price of healthy snacks by 25 cents in the vending machines – with no time delay on unhealthy snacks. The effect "is not huge, but if you are to extrapolate this out across 1 million vending machines and over time, it could add up to something meaningful." Adding a 25-cent tax on unhealthy snacks and adding a delay plus a healthy-snack discount resulted in greater increases in healthy food sales than the delay alone. But Appelhans says the delay has some advantages over price changes. "Unlike the discount, the delays didn't harm the overall revenues of the machine. 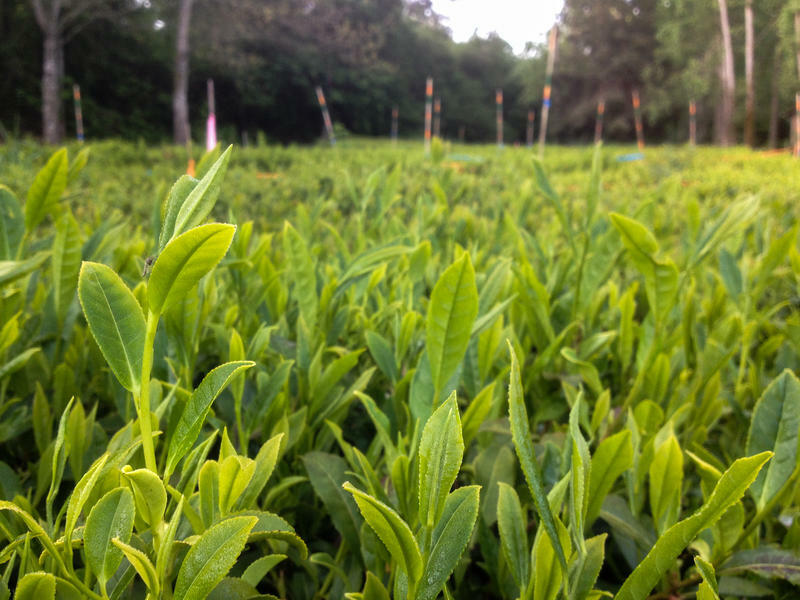 Places want people to have more nutrition, but they don't want to lose revenue. So the time delay might be a nice way to have it both ways," he says. And trying to increase the prices of unhealthy foods has caused trouble for some in the past. "There are a lot of problems with trying to use taxes or subsidies," says David Just, an economist at Cornell University who was not involved with the study. Local or state governments that have tried to implement taxes on sugary drinks, for instance, have been met with a lot of resistance. "It makes a lot of people who work to fight food insecurity nervous when we talk about providing monetary incentives away from bad food. We have a good idea that those taxes are likely to hit food insecure houses harder." Implementing a time delay could be a way to skirt that issue, Just thinks. "Time, especially small amounts of time, is something pretty much everybody has and wouldn't [present] the same sort of problems. It's just an inconvenience in a minor way. In that sense, this is promising," he says. Why it works is still a little unclear, says Marlene Schwartz, a psychologist from the University of Connecticut who studies how our environment shapes eating attitudes. "It could be that people don't like waiting and will pick a quicker choice. And also you're giving them time to think about it," says Schwartz, who was not involved in the study. "It's clear in these machines which are healthier options. Building this in probably increases the amount of attention to the healthier options." But showing that the delay is specifically tied to unhealthy snacks could also have some risk, Schwartz points out. "There is a risk that people would get upset with the delay because people know it's just to influence their behavior. Some might complain," she says. More obstinate people might purposely wait out the 25-second delay just in protest. A better way to go would be to sneak the delay into the machine, like forcing the vending spirals to turn really, really slowly for unhealthy snacks, without anybody knowing, she says. Still, the delays are pretty creative, Schwartz says. "I think this is a brilliant idea. I was very excited when I saw it," she says. "There have been studies looking at slowing down elevators so that it would be faster to take the stairs. That also struck me as a good idea." And there might be ways to take it beyond vending machines, Appelhans says. You could make it so that filling up a smart shopping cart with healthy foods would kick you to a fast checkout lane at a supermarket, for instance. "We don't have anything like this in existence," he says. "Hopefully, it'll be more palatable compared to restricting choices or price increases." For the last 20 years, Americans have been having a conversation about sustainable seafood that was largely focused on fish purchased at restaurants or fresh seafood counters. 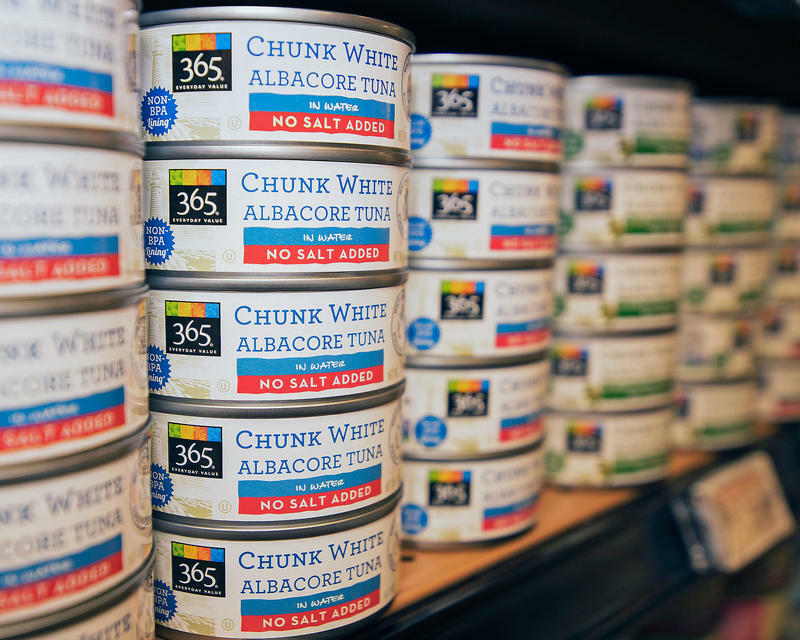 Armed with seafood guides, thoughtful customers were encouraged to pose questions about where their fish was caught and what type of gear was used — questions that are far trickier to pose in front of a wall of canned tuna in the middle of a supermarket.